After her backside got some feathers back. How I Got "Thrown in" to Keeping Chickens? My hubby started working out of town, in a very rural area. My Father-in-law, youngest daughter and I were just leaving from a visit. In the middle of the road ahead, I could see this chicken just sitting there on the line that divided the lanes. I had never really encountered a chicken that wasn't in the store or served up with some kind of seasoning. So I figured that she would move when my van came close, but she didn't. I put the van in reverse, and stopped and said, "Dad, get that chicken." He said, "What chicken?" So, he got out and got it. She was stinky and filthy. She had fallen off of one of the poultry trucks. 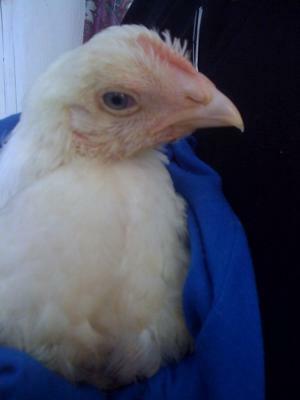 She had no feathers on her bottom and was covered with feces. We went to my hubby's job to show him the chicken and ask him if she could get a bath. His first question was, "What are you gonna do with it?" I said, "Keep it." He got off of work and bathed her for us so that she could make the hour and half drive home. And after about 4 months of having her, she has taught me a lot. We learned that the swelling on her chest everyday was NOT a tumor and when she is laying in the dirt on her side, with her wing up, she is still alive! My daughter and I went out and bought 4 baby chicks! Still don't have a coop yet. Working on it. But that is how I progressed from "chicken ignorant" to a "chicken pre-schooler". 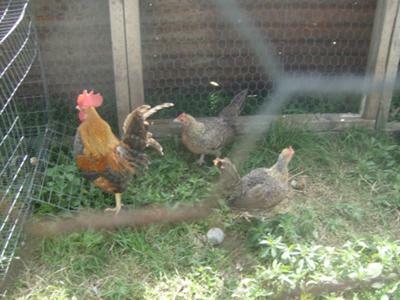 Mexican Creole Chickens: Several Months ago, I rescued a flock of small bantam type chickens that had some how survived the winter here in Texas in an open air pen an elderly lady had them living in. There were 17 in the flock. Many had lost toes, frostbitten combs and horrible leg mites. "No one will buy them" She told me. I just looked at them and paid her sixty dollars for all. I brought them home and applied medication to their combs and feet for a few weeks. Gradually, I saw each of them begin to heal. I was curious about these "Creole" Chickens and began to do research on them finding they come from a small village in Mexico Calle Oaxaco. They have become my favorite of all my chickens. Very calm, friendly little birds that are happy and healthy now. Here's Kevin and Sherlock in their pen. If anyone has a guess on what breed or breeds Sherlock could be, I'd love to hear! Mystery Chicken: I am a member of the local 4-H Club, and have mostly raised ducks in my backyard. 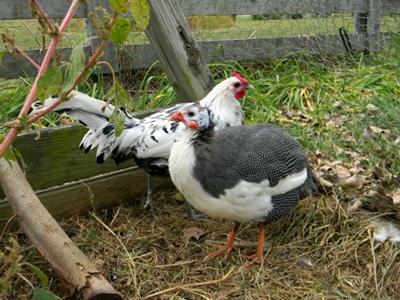 On of my fellow members attempted to raise market chickens for her project. At the hatchery there was a minimum order of buy-25-get-one-free. Her market birds were growing really fast, and of course reached full weight within a few weeks. The 'bonus' chicken was still tiny, and no one in the club could identify it. Because of it's small size, it was kept away from food and water, and became very ill. I volunteered to take it home. I had never really raised chickens before, and this one grew so slowly. It lived under a heat lamp until it had most of it's feathers, then lived in an outside 'aviary'. We couldn't tell if it was a male or female, (My older sister called it Justin Beiber) Until he crowed. His proper name is Sherlock the mystery bird. He was lonely, because the ducks bullied him, so I set out to get him a companion. 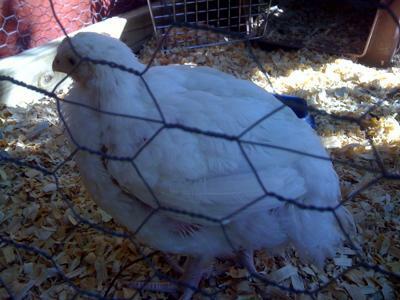 The same 4-H friend we got him from had been given a baby guineafowl. "What on earth is a guineafowl?" Ask anybody, and they'll probably say, "Never heard of 'em!" We introduced Sherlock and the guinea, and they are inseparable. They both hate it when they are apart! We eventually named the guinea Kevin, because of it's crazy resemblance to the animated bird from the movie UP. Not exactly a rescue story, but cute all the same.